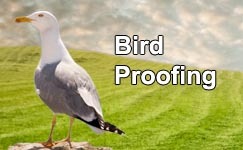 Keep birds from roosting or landing on any surface. The sticky bird repellent liquid is ideal for larger areas, trees, shrubs and other hard-to-reach areas. Easy to apply with a 40 psi power or hand sprayer, or paintbrush. Safe to use in any weather, indoors or outdoors. The Bird-X bird proof liquid’s non-toxic formula creates a sticky surface that is uncomfortable to birds. Birds don’t like the sticky feeling under their feet and learn to avoid the area in the future. 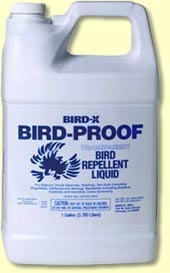 Bird-x bird repellent liquid is easy to apply using a 40 psi power or hand sprayer, or paintbrush. It is ideal for any surface. The bird repellent liquid comes in a 1 gallon (3.785 Litres) bottle. Each gallon treats approximately 120 square feet (11.15 square meters) of surface or an average tree with a five inch diameter trunk. The product remains tacky and effective for up to a full year or longer. Pests: Sparrows, Pigeons, Starlings, Swallows, Mynas and other pest birds. Uses: Trees, branches, shrubs, roofs, and hard-to-reach areas. 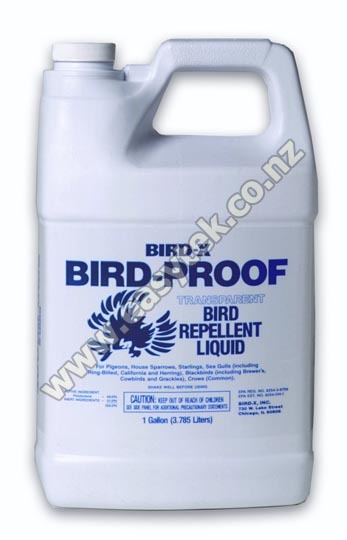 Bird Repellent Liquid - 1 GAL reviewed by John F., Waipukurau on 2016-10-12 . I placed my order at 12-15pm on Sunday 9-10-2016 and it arrived at my place in Waipukurau at 10-00am Wednesday 12-10-2016. You couldn't ask for better service. Bird Repellent Liquid - 1 GAL reviewed by Tammi S., New Plymouth on 2015-10-13 . Your product is awesome, and my fences are free of bird poo. I just love it. Im going to put it on wooden blocks and place in vege garden as well. Thank you for having such a great product. Bird Repellent Liquid - 1 GAL reviewed by Les N. on 2014-10-05 . Bird Repellent Liquid - 1 GAL reviewed by Russell . on 2012-08-29 . Product effectiveness yet to be assessed.